While some local residents footed the bill for $40 general admission tickets to the annual Thunder Over Michigan air show this weekend, others found the perfect spot to watch the show for free. Aircraft of all kinds, including the United States Air Force Thunderbirds, took to the skies at Willow Run Airport on Aug. 25 and 26 for the show presented by the Wayne County Airport Authority. 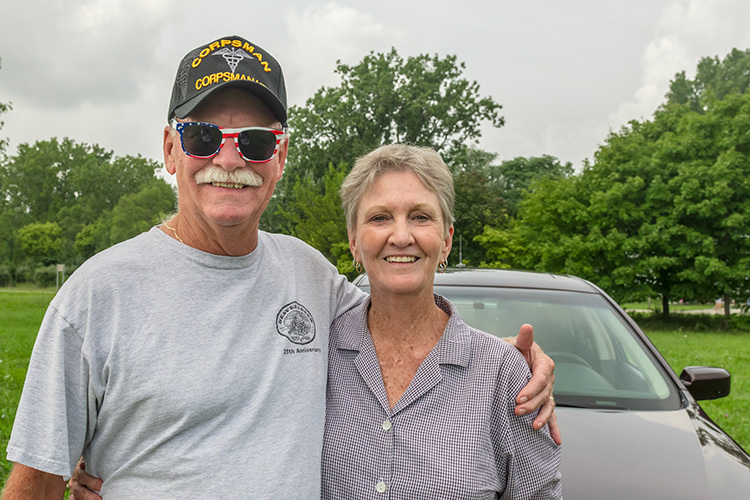 We spoke with residents both inside and outside the confines of the airport about their experiences enjoying the air show as members of a community whose history is intricately linked to aviation. Simon, a Troy native, moved to Ypsi in 2012 when he joined the aviation program at Eastern Michigan University (EMU). He decided to study at EMU because of its proximity to Detroit Metro Airport and Willow Run Airport. "I love being at a historical airport, especially with Willow Run here being the heart of the World War II operations," Simon says. "'Rosie the Riveter' was coined here. One of our hangars houses the (North American Aviation) P-51 Mustang." 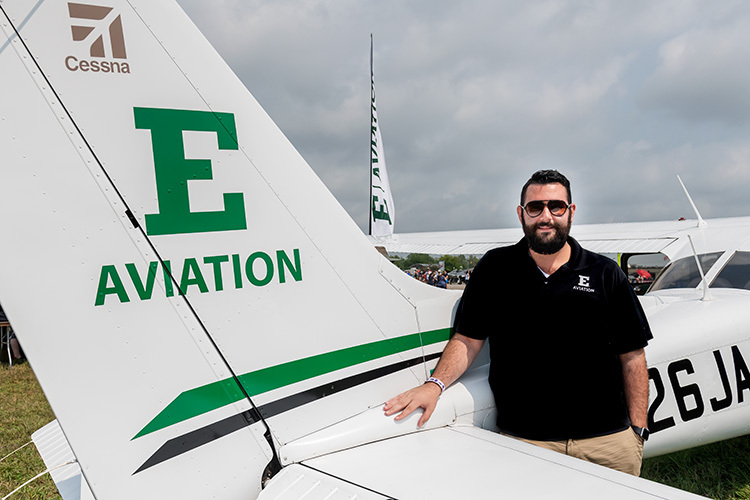 As the director of enrollment for the aviation program, Simon was manning a tent at this year's Thunder Over Michigan in an effort to spread the word about the program, but he's been attending the annual event since he was a kid. His favorite part of the air show is the community building that occurs because everyone in attendance shares an interest in aviation. "I remember being one of those kids out there, staring at these huge aircraft, wanting to fly them," Simon says. Basler moved from Alpena to Ypsi to work at the Willow Run Bomber Plant during World War II (WWII). For about two years she says she "drilled the holes so Rosie could rivet them" in the fuselage of B-24 planes. Then she joined the United States Coast Guard Women's Reserve, known as the SPARS, and served as a cook for just over a year until the end of the war. She moved back to Ypsi to work for the Kaiser-Frazer Corporation at Willow Run, and still lives in Ypsi today. "I’m a pioneer woman, I guess," Basler says with a laugh. "First to work in a factory and then first into the service." Since the 95-year-old is one of the area's original "Rosie the Riveters," she participates in various events with the Yankee Air Museum, 47884 D St. in Belleville, including Thunder Over Michigan. 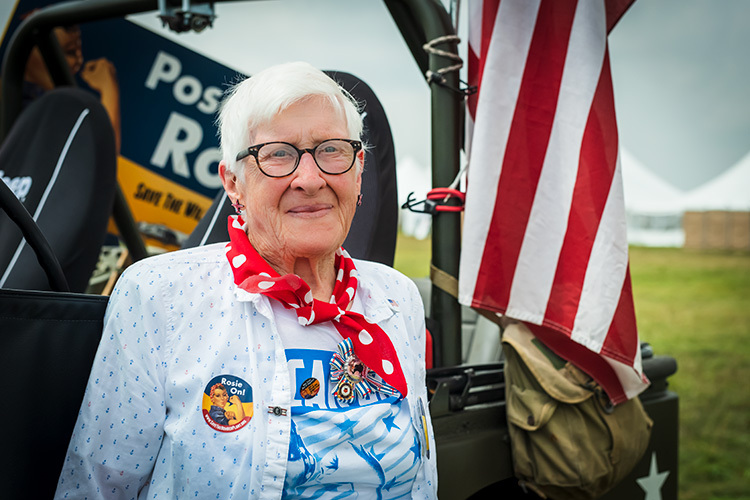 She was among several original Rosies who posed for pictures and chatted with Thunder Over Michigan attendees over the weekend. 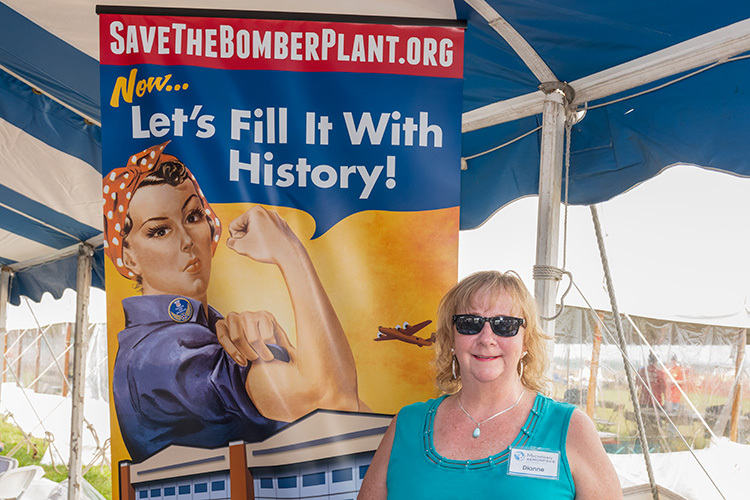 When she was a young woman working in the bomber plant, Basler didn't understand the historical significance of how she was contributing to the war effort. Then 19 years old, she was just interested in getting paid. But now she realizes what she and the other original Rosies did. "It was just a job at the time," Basler says. "I didn’t think of it as being something really historic. I knew I was working in this huge plant, that we’re putting out a plane an hour, and there were these Air Force people that were there to fly it off the line. It was amazing, but I didn’t see that." 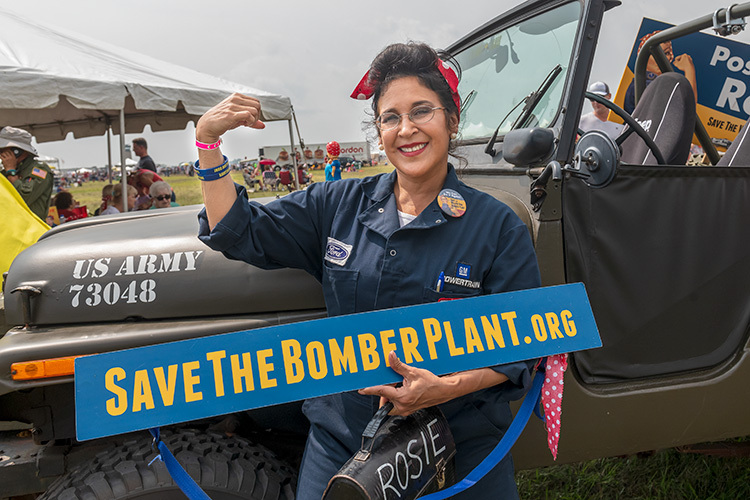 Gutierrez, who recently moved to Ypsi from Ann Arbor, started volunteering with the Yankee Air Museum in May 2013 when it launched the Save the Willow Run Bomber Plant campaign. She initially got involved because she wanted to see part of the bomber plant preserved and transformed into the new home of the Yankee Air Museum. "It’s an important piece of history," Gutierrez says of the bomber plant. "They had never built airplanes on a production line before. So that was Detroit know-how and Detroit innovation in southeast Michigan, and I’m so proud to be from this area and I want that bomber plant to be saved as a museum for everyone." Gutierrez says the best part of her experience as a volunteer over the last five years has been meeting and getting to know the "amazing" original Rosies who participate in events with the museum. She says they "stand for so much," including feminism and patriotism, and she believes they still carry the same spirit with them today. Gutierrez has been attending Thunder Over Michigan since she got involved in the Yankee Air Museum in 2013. She loves meeting people at the event who have personal connections to WWII or the Willow Run Bomber Plant. Her favorite memory of the air show happened this year when she listened to a conversation between Basler and a former Tuskegee Airman. Salata has been managing a VIP tent for the Michigan Aerospace Foundation, the direct fundraising entity for the Yankee Air Museum, at Thunder Over Michigan for about 12 years. But before that, the Ypsi Township resident had attended the air show for years. "We love seeing the Blue Angels and the Thunderbirds and all of the other airplanes that are here as well," Salata says. "My husband, Phil Salata, is a big aviation buff as well and we come to the museum a lot and enjoy it. We’re just very dedicated to supporting the history and the next generation to understand what happened in the past." Salata tries to invite more families with children to Thunder Over Michigan so younger generations can get involved in the Michigan Aerospace Foundation and learn about the Yankee Air Museum. She thinks it's important to remember the role that the Ypsi area played in the outcome of WWII since Ford Motor Company helped the U.S. government establish its "Arsenal of Democracy" by building the Willow Run Bomber Plant. 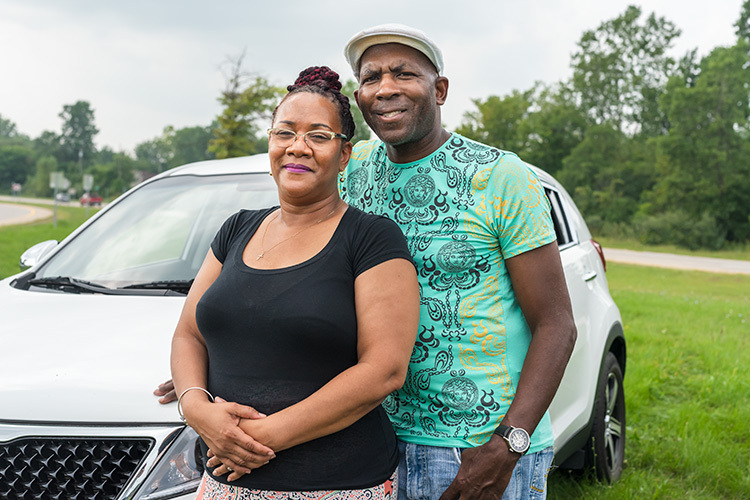 The Johnsons live in Ypsi Township near the intersection of Michigan Avenue and the US-12 business loop, where they pulled off in their car to watch the Thunderbirds perform during Thunder Over Michigan. They used to be able to watch the air show from their yard, but the trees have grown a little too tall, so they found a new place to get a clearer view. They've seen people park in the spot where they chose to watch from every year. The couple tries to watch Thunder Over Michigan every year. Darlene says she likes watching the planes do tricks and Thomas says he likes the loud noise. The Johnsons were kicking off their date night with the Thunderbirds before they headed down to Belle Isle in Detroit for the rest of the evening. The couple has been together for 32 years and married for 29 years. Darlene thinks it's important for couples to enjoy date nights together. "That's how we got to 32 years," she says. Thunder Over Michigan has been an annual tradition for the Hizers since the '70s. They've previously paid for entrance to the air show, but in recent years they've just hopped in their car and scouted out an area with a clear view of the flight path. They watched from the same place as last year because it's the best spot they've found so far. The Hizers' favorite part of Thunder Over Michigan is the Thunderbirds or the Blue Angels, whichever flight demonstration squadron is set to perform. "I grew up in Florida," Kathy says. "I’ve seen them practicing back in the ‘50s. The Blue Angels would come in the summertime. I think the Thunderbirds would come out of Homestead Air Force base (in Miami-Dade County, Fla.). We used to see them all the time so I was always fascinated. Plus my dad worked for an airline, so planes were kind of a thing." The couple lives in Ypsi Township near Willow Run Airport, so they enjoy watching the planes fly over their house. They think a lot of their neighbors are interested in the planes flying overhead too. "As soon as you hear them come over, you’re out the door," Kathy says. Andrew was born and raised in Ypsi Township, so he's been watching Thunder Over Michigan since before he can remember. 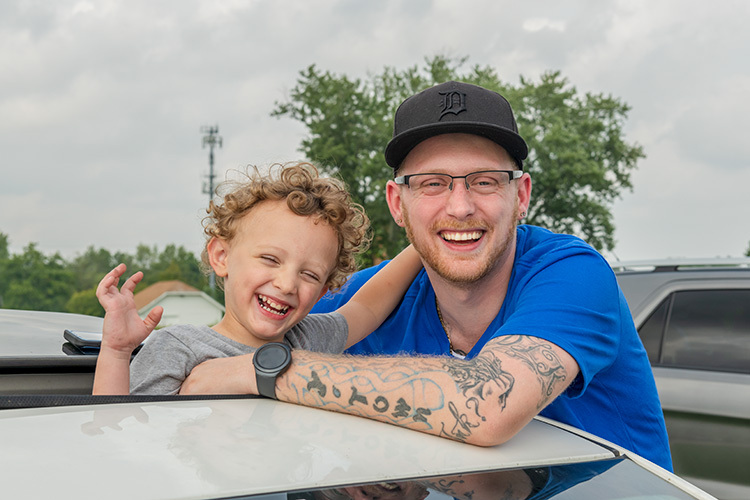 He used to watch the air show with his family from inside Willow Run Airport or at his aunt's house in Gault Village, but most of his relatives have moved or were out of town, so he and his 4-year-old son, Aiden, decided to drive around and find a place to watch from their car. Andrew thinks this might be the first year that Aiden will remember watching the air show with him. Thunder Over Michigan is an annual event that Andrew looks forward to every year. His favorite part is the "thrills" and "adrenaline" that he gets from watching the planes fly low. He recalls watching the air show from his mom's house and waiting for the finale when a plane would usually fly directly over the home. "You hear them (practicing) Thursday and Friday and you start getting pumped up to see them," Andrew says. "I grew up in Ypsi, so even being in elementary school, you’d see them flying over while playing at the playground in my neighborhood. You hear them and your heart starts going and you’re excited to see them."